Bicicletería Peña, in Pririápolis, Uruguay. 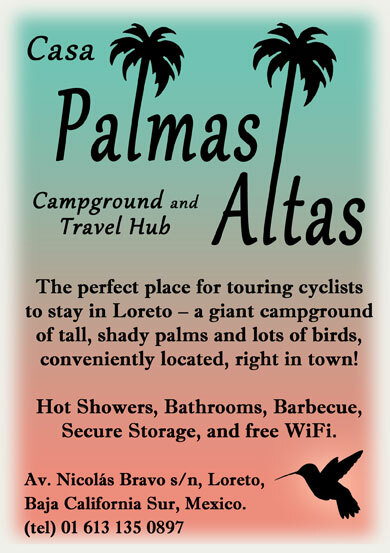 I’ve visited some great bike shops in Latin America. In Buenos Aires, in Santiago, in Bogotá. Once, I had an entire drivetrain replaced at a huge bike shop in Panama City. At these kinds of bike shops (that is, big shops in big cities in countries with a culture of cycling) you can often find what you’re looking for. 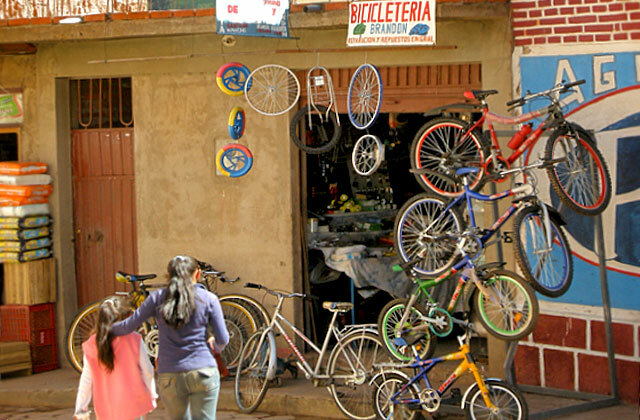 In the rest of the continent, a trip to the local bicicletería will leave you empty handed. Even so, I always check out the little bicicleterías I find tucked away in Latin America’s towns and villages. It’s possible they’ll have something I can use in the size I need (brake pads, inner tubes, extra spokes; simple things), but usually, they don’t. This is why I have low-tech components on my bike; cantilever brakes, bar-end shifters (downtube shifters would be even better). 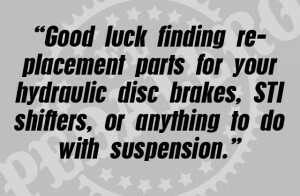 Good luck finding replacement parts for your hydraulic disc brakes, STI shifters, or anything to do with suspension. Sure, you could carry replacement parts for everything that might break on your trip, but you’ll be lugging a lot of extra weight for very little benefit. Best to keep it old school. Even if you don’t need anything, it’s still a good idea to visit the bicicletería. It always results in a friendly conversation where you’ll learn something important about cycling in the area (road conditions, local laws, places to visit, places to avoid). Also, I admit part of the reason I visit these hole-in-the-wall bicicleterías is because I enjoy the reaction I get when they see me roll up on my fully-loaded touring bike. Finding bike parts in Cuba is another story. How do you find bicycle-related stuff in a country where it’s almost impossible to find any kind of stuff? The answer is, you’ll have to ask around (and this could take some time). I started a three-month trip in Cuba with a smashed derailleur courtesy of Air Canada’s baggage (mis)handlers. Realizing there were no bike shops anywhere, I started asking around. Eventually, through a chain of “I know a guy who knows a guy who knows a guy” conversations, I met Garbey, the guy behind all the guys. Garbey had the right tools and knowledge, but not the right derailleur. However, he knew a guy in another town who did. In the end, this guys-knowing-guys process took so long that I wound up staying with Garbey and his family for several days until the derailleur was replaced. So much of bicycle touring involves making it up as you go and making do with what’s available. What have been your experiences at the bicicletería? Share a comment below. 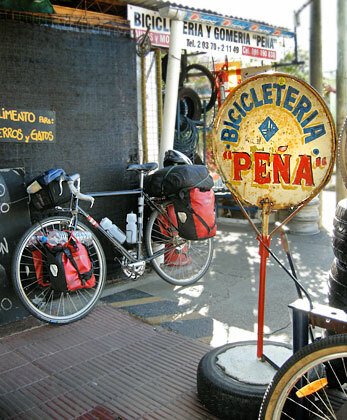 Feature image (top of page): “Bicicletería Brandon” in Betanzos, Bolivia. 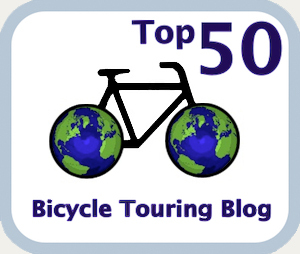 I’m very happy to have found your blog, it’s difficult to read about cycling in cuba. I would like to go to Cuba to have cycle trip (like two month) and I have one question. It’s quite expensive to get your own bike to Cuba. So, when you talk about the bike shops, it’s possible there to buy an entire bike good enough to do sth like 50km a day and carrying a 15kg luggage ? (I don’t want to do performances, it’s just a way to travel slowly). I’ve read some stuff about how difficult it is to get a bike in Cuba, but the posts were quite old and I imagine that the country is changing quickly now. I’ve been happy to see that there were bike to sell on the first picture ! Sorry about the late response. I don’t like to blog while I’m on an adventure. But to your questions… Yes, I think you’re right about the situation in Cuba constantly changing. When I toured Cuba it would have been very difficult (if not impossible) to set up a touring bike with appropriate gear. Nowadays, I couldn’t say for certain, but I would imagine it would still be better to arrive with all you need and not have to depend on what’s available in Cuba. And, yes, slow touring is the way to go, whether it’s in Cuba or any other country. Fan effing tastic site! I am a very experienced pedaler and have learned a ton. I reread everything and look forward to (hopefully) any newer articles. This beats movies every night of the week. 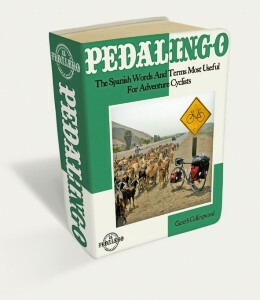 I have a 7 speed freewheel and am thinking that a cassette set up will serve me better, but I’m wondering if 7 speed cassettes are plentiful/abundant in SA or should I just carry a load of spares for a journey to the southern reaches of Argentina? And Does it seen that 36 spokes or 32 would be more common. I do absolutely ALL of my own repairs and can always think of something, but it would be good to have 36 spokes, in most cases. Thanks to any and all for info and to Gareth for the site and takes me book stuff. Are there any parts that are really common in Latin America? I’m thinking tire sizes, brakes, and such. My friend had a bent rim and had to wait a week for a replacement to be ordered and this was in the US! Honestly, since writing this article (and definitely since my first tours in Lat Am) I have seen an improvement in availability of parts and in bike shops in general throughout Latin America. For quality parts and accessories, prices are a little higher than you’re probably used to paying. I recently had to replace a stem in Mexico and, while I was very happy that I found a replacement, I was a little disappointed at the price, which was about three times what it would have been in Canada or the US. Still, I was in no position to complain at that moment. Yes, bent rims are a hassle! I once found a bicycle hobbyist in Honduras of all places who fixed my bent rim for free. He just wanted to see if he could do it and he did. In fact, he did a much better job than I would have done (I’m still not a very good mechanic even after all these years of touring).